Rescue teams searching for a teenager who went missing during heavy flooding have recovered a body. Mitchell Taylor was last seen in the early hours of last Saturday after leaving a bar in Tewkesbury. The 19-year-old's family said his disappearance, which coincided with the peak of the floods in the Gloucs town, was "totally out of character". 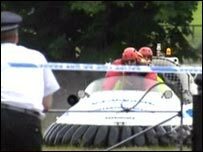 A police spokeswoman said the body had been discovered by an Italian hovercraft crew in a submerged field. The team, from Turin, arrived in the county a few days ago to help fire crews working around the Mythe water plant. They were called to search the fields around Gander Lane on Saturday morning in a specialised type of hovercraft. Within minutes, they found the body tangled in undergrowth. Firefighters then had to swim to the body before they could recover it. Tally Gianpa from Gloucestershire Fire and Rescue Service said: "The body of a man was discovered near a tree by the hovercraft team 10 minutes after they had taken to the water. "Our thoughts go out to the family. This is yet another tragedy in Tewkesbury. "The field has varying degrees of depth and is a mixture of land and water and is an area which lends itself well to hovercrafts, which have been brought in from Italy." Police said the body has yet to be identified and that the coroner has been informed. A 64-year-old man and his son were found dead in the town on Wednesday. Bram Lane and his son Chris died while they were cleaning up flood water at Tewkesbury RFC.